At any given moment I have about 50 tabs up on two different browsers much to the chagrin of Mr. Lovebird. "You're destroying your Mac!" he tells me constantly. I try to explain it's a function of how my mind works, but he just doesn't get it. Wet wipes to freshen up? Ummmm yes. Sprinting off the toilet to go somewhere? All. The. Dern. Time. (Why do I always have to GO GO when it's time to leave the house?). Finding the previously reheated coffee when going to reheat the next day's cup of coffee? #mylife. The food on the shirt? Yep. Constantly. 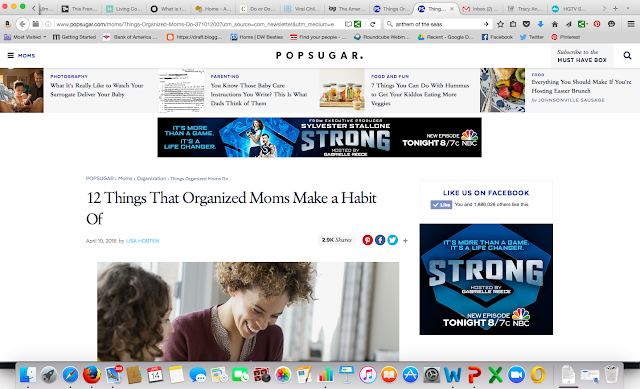 So apparently I'm stuck between the Hot Mess Mom and Organized Mom. Anyone else feel like this? The worst part is my brutally honest Kindergartner now calls me out on it: "Mom," she said a couple days ago, "I saw you wear your pajamas to drop-off." Whoops! I thought quickly: "No, that was just my t-shirt I sleep in sometimes. It's not technically part of a PJs set so it doesn't count." I don't think she bought it, but she shut up for the moment! Are you more Hot Mess Mom or Organized Mom or a combo, like me? A quick tip: as an Organized Hot Mess Mom, I've learned to keep a regularly stocked "mommy's-not-prepared" emergency bag within the diaper bag. It has basic toiletries including deodorant, hand cream, tissues, toothbrush, toothpaste, lotion, mints and if I can remember I throw a granola bar or nuts in it too. It helps me feel more organized than hot mess! P.S. There's still a few hours left to enter to win my Star Wars giveaway that ends at midnight EST, Thursday, April 14!